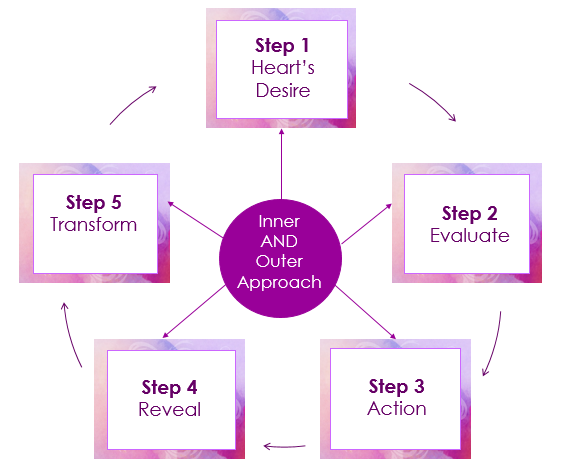 I use an Inner and Outer Approach in my 5-Step Coaching process for 1-1 coaching sessions, group coaching, classes and programs. In this step You'll create a vision for your money and your business. You'll begin to clarify your goals and set an intention for Your Journey. I use the Visioning Process and teach my clients to use Deliberate Attraction to create and begin to magnetize their vision. You'll choose from the 5 main areas of focus: Income, Process, People, Knowledge and Resources to focus your goals and intentions. Just like with any journey, once you clarify your destination you need to know where you're starting from. You'll Assess where you are right now in your business, finances, mindset and the 9 environments of your life, so that you'll have the power to make the changes necessary to reach your desired results. This is where you'll create a plan that will bridge the gap between Your Vision and where you are now. Your action plan will keep you headed in the right direction, continuing on Your Journey and arriving at your goal. You'll create an action plan based on: (1) The current stage of your Business (Creating, Building or Sharing Wealth), (2)Your current skillset, (3) Your Sacred Money Archetypes®. I assist my Clients in using the Deliberate Attraction, Emotional Freedom Technique (EFT) , Emotional Brain Training (EBT) and other Accelerated Learning Practices to Assist in removing the blocks to achieving their results. T - TRANSFORM - Vision with Action....creates Transformation! Many times when we reach milestones or goals, we get stagnant, complacent or slip backwards because we don't have a focus or direction towards what's next. In this step you'll celebrate the progress you've made and have a clear direction of what's next.